December 2012: No meeting (Holiday). AdobeConnect soft launch. It was a busy year for the handoff. The archive was eaten by the internet void. It was a blur for me. December 2004 Special presentation by BDA: State of the Industry 2004. An industry-wide panel discussing the pivotal issues facing our industry today. December 2003 Anark Studio 2, Tony LaTorre on AOL’s Matrix Global First Feedback Project, yU+co on Shake, Multiscreen Space Museum for NASA. December 2002 Special session on running your own business, including as panelists Beth Roy (motion graphics freelancer), Michael Kelley (Idiot Box), Trish & Chris Meyer (CyberMotion), Lloyd Alvarez (BLINK.fx), Sam Schoemann (class-key chew-po), and Ann Epstein (E! Networks). March 2002 Getty Images stock footage focus group, Digital Anarchy plug-ins for After Effects, Zaxwerks 3D Invigorator Pro for After Effects, Electric Image Universe 4, and demo reels. February 2002 Kevin Dole and Digikam plus toy commercial production, Sonic Desktop Sonicfire Pro, Apple Final Cut Pro 3, guest studio Belief on projects for Acura and Sony India, and artist Valerian Bennett on a project for First Americans in the Arts. January 2002 Lachlan Westfall of Quiet Earth and New York Islanders video, Ken Locsmandi of Filmworks/FX and Smashmouth music video, and Adobe Adobe After Effects 5.5. 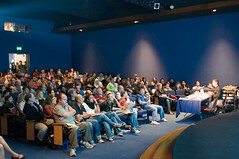 December 2001 A special meeting that featured a panel discussion on running your own motion graphics business. Panelists included Wendy Vanguard of Manna-Design, Frank Capria of Kingpin Interactive, Ken Locsmandi of Filmworks/FX, Matt Silverman of Phoenix Editorial, and Chuck Carey of Trioka Design Group. November 2001 Synthetic Aperture & Echo Fire plus Color Finesse, Visual Infinity & Grain Surgery, Associated Production Music on music licensing; ATTIK & NoiseFour. October 2001 Wacom Intuos 2 & Cintiq, Crew of Two and Duality, electricFX and eFX Pyro plus Channelizer, dvGarage and new products including shooting panoramas. September 2001 Alias Wavefront & Maya under OS X, artists ShimFilms on low-budget high-impact production, Final Cut Pro 2 with Matrox RTMax. August 2001 3 Ring Circus & The State of Design, Automatic Duck Composition Import, Maxon Cinema 4DXL v7.1, TrapCode Shine. This summary includes the special meeting at After Effects West: an evening with the After Effects team. Motion Graphics Los Angeles (MGLA) was started in August, 1997 by Chuck Nigash, Erik Dehkoda, Trish Meyer, and Chris Meyer by merging together the then-existing After Effects, Electric Image, and Hollywood 3D user groups with the philosophy that an artist often has to employ not just one program or system, but a combination of 2D, 3D, and editing hardware and software to realize their vision – and that artistic inspiration can be universal. Erik and Chuck soon left to pursue other interests, but Trish and Chris remained hosts for 10+ years spanning 125 consecutive monthly meetings plus 3 special events. They hosted their last MGLA meeting December 18, 2007. Ko Maruyama, Warren Heaton, and Tony Romain helped co-host MGLA for last few years of MGLA’s existence, and are carrying on in the form of a new group called Digital Media Artists Los Angeles (DMALA). They deliver the same quality experience to the Los Angeles motion graphics and visual effects community.